The Police have revealed how a bank worker hacked into customers' bank accounts and diverted over N3million into some private accounts as they declare the suspect wanted. The Nigerian Police Force have declared a worker with a bank in Lagos State, wanted for allegedly defrauding some customers of the bank. According to a report by PUNCH Metro, the suspect identified only as Bunmi, hacked into customers’ bank accounts and diverted over N3million into some private accounts. It was gathered that the fraud was uncovered after owners of the accounts complained about their disappearing funds, which made the bank to institute a probe. The bank management reportedly blocked the accounts into which the funds were transferred. Owners of the blocked accounts, who were reportedly unaware that their accounts were being used for fraud, were said to have reported at their various branches and complained of the development, and the bank management was said to have handed them over to the police. While speaking to correspondent, the Zone 2 police spokesperson, CSP Dolapo Badmos, said further investigations led to the arrest of Bunmi’s accomplices; Babalola Akinyele, aka Olumba; and Adeshina Adenekan, aka Oluwo Ake. 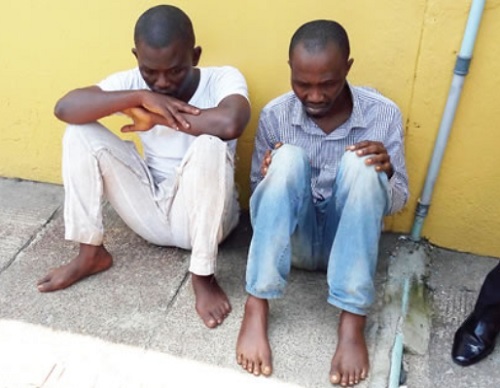 She said further that the two men tricked the account owners into releasing the numbers, adding that the duo shared the proceeds of the fraud with the prime suspect, who was at large, adding that N3m had so far been traced to the suspects. 35-year-old Akinyele, an indigene of Ondo State who claimed to be working for a bet company, said he met Bunmi at a car wash.